We Fell In Love With These 10 Bridal Earrings! There are lots of accessories to think about when it comes to your wedding day including earrings, necklaces and bracelets. Let’s also not forget hair accessories, good luck charms and something blue. When it comes to earrings you want to be sure that you wear something that stands out enough to make a statement but not too much to take away from your dress. How you wear your hair will also impact what type of earrings you choose to wear on your special day. You’ve also got to consider a big factor being the cost. We know you’re not going to want to skimp on price because it’s your special day but we understand that you’ll have a strict budget and you’ll want to spend more money on your wedding dress then your wedding earrings. So we thought we’d make your job easier by browsing the web and choosing the best bridal earrings that you’ll simply love to wearing on your special day. We hope you’ll be pleased with our selection! The best way to describe this pair of bridal earrings would be a chandelier! If you’re looking for some special decorative earrings this could be exactly what you’ve been looking for! These dangly earrings are a lovely statement piece that will look stunning worn with your wedding dress. 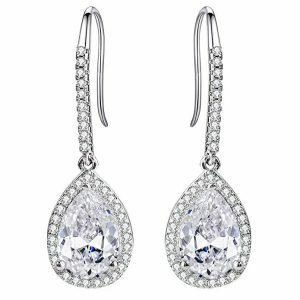 The chandelier inspired earrings have been designed with a gleaming oval cut zirconia gem in the centre, securely posited in a pave setting. When the light reflects on this gem you’ll be memorised by the glorious sparkle. To give you an idea of the size of these earrings they’re approximately 9.5cm in length. They have been created using a silver metal that has a platinum plating which makes the silver extremely tough and durable. It will also give the earrings a lovely shine. The earrings have also been designed with disks on the back of the earrings, providing extra comfort. Looking at these large earrings you may feel a bit wary about wearing them due to their weight. However you’ll be surprised to hear that they’re not heavy at all. They’re actually super light which makes them a great fit for your earlobes. It’s important to point out that the designer has used only the best cubic zirconia diamonds to create these. They are in fact AAA Grade quality, making them the finest quality around. This also guarantees you get a brilliant diamond like shine from these cubic zirconia gems. You’ll be pleased to hear that these earrings come in a cute little gift box. If you’re not completely pleased with your purchase the jeweler also offers you a 100% money back guarantee. The jewellers, Lilie &White are known for creating fashion jewellery for any occasion! This jeweller founded in 2007 and is one of the top chain stores across Europe and the USA. They have plenty of experience in fashion jewellery and offer a variety of designs, new and old. If you love rose gold jewellery this pair of earrings are also available in a gold tone rather than just silver, giving you another option to choose from. This pair is being sold for a low price. Take a look at their collection of jewellery today! If you want a more understated look these cluster style earrings will add a nice bit of shape to your accessories but will not go too over board. They’ll also promise to add a bit of sparkle and glam to your bridal outfit which you’ll simply love! These consist of a cluster of cubic zirconia jewels which give off a lovely shimmer. The earrings have an elegant French pierced backing, making them really comfy to wear. They have been plated in a platinum based silver rhodium. The cubic zirconia stones have been set in a luxurious cluster which will frame your face perfectly. They’ll also add a touch of glamour to your wedding dress. 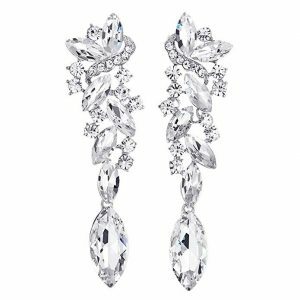 Again, this designer has chosen to use the finest quality cubic zirconia gemstones, these being AAAAA grade which give the earrings a beautiful shine. We also love that this jeweller offers a 100% money back guarantee if you’re not 100% happy with these earrings. However we don’t think this will happen! These gorgeous earrings arrive in a luxurious embossed signature gift box. Therefore if these are a gift you’re giving to the bride on her wedding day you won’t need to worry about wrapping them, because it’s all done for you. You’ll be pleased to hear that you can also buy a matching bracelet, ensuring you have a lovely set to wear on your wedding day. The earrings may look a little on the heavy side but they’re actually very light and comfortable to wear. They’re not too long and not too short so work great as an in-between option and give your wedding outfit a bit of bling. These stunning earrings have been created by Mariell and are being sold for a low price. You’ll notice from their website that Mariell specialise in bridal and jewellery accessories. Earrings, necklaces and bracelets, they offer plenty of choice when it comes to accessories. All of their pieces are extremely classy and elegant as well. Have you been looking for some really long earrings to wear on your special day? If the answers yes, then these may be the perfect accessory! These shimmering earrings consist of four circular jewels in a row with a pear drop shaped jewel at the bottom of the dangly earrings. To give you an idea of the size of these they’re 2.9 inches long by 0.7 inches wide. It’s also important to be aware that each earring weighs approximately 8.5g. Much like one of our previous pairs of earrings, these earrings are called chandelier earrings because they resemble similar to that of a chandelier. The materials used include Australian crystals which have been crafted from an eco-friendly zinc alloy. What’s great about these crystals is that they are nickel and lead free which mean they’re safe for people to wear who have sensitive skin. You’ll also notice that there is a lot of attention to detail that has gone into these earrings. We love how the smaller jewels frame the main crystals. These have been cut into a small circular shape and add that extra sparkle to the earring. These earrings are absolutely gorgeous. They also shine and sparkle beautifully. You may think that these are clip on earrings but they’re suitable for ladies to wear who have pierced ears. The jeweller also sells them in a variety of colours including champagne gold, emerald, iridescent, royal blue and ruby. These will arrive in a pretty little blue signature box, keeping your lovely earrings safe. When it comes to the price, they’re being sold by BriLove for a low price. We think these are a fantastic buy and would be the perfect accessory to wear on your wedding day. Looking at BriLove’s website they specialise in wedding jewellery and pieces to be worn on a special occasion. They sell earrings, necklaces, bracelets and hair accessories, all which have one thing in common, they sparkle! These are a pair of tear drop earrings that you’re bound to love! 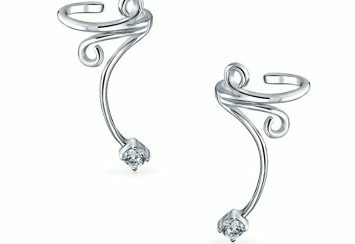 The dangly pair has been crafted with a tear shape jewel in the centre of the earring. It then includes smaller circular diamonds framing the jewel in the middle. The jewels are attached to a dangling hook that is covered in single diamonds. Overall these earrings are extremely sparkly and will look very pretty on your ears. The jewels used to create these are a silver-tone cubic zirconia gemstone. These not only give the earrings a wonderful shine but they look very beautiful. The metal used is a brass metal that has silver plating which gives the earring a high polished finish. These earrings are also nickel and lead free making them perfect for people with sensitive skin. These are smaller than any of the other earrings we’ve reviewed so far. To give you an idea of the size they are approximately 0.4inches wide by 1.3inches long. They also weigh approximately 2g each. When it comes to the backing of these earrings they have a shepherd hook which makes them extremely comfortable. This style of hook also complements the sleek minimalistic design of the earrings. This pair will come in a cute pink drawstring fabric bag and a white cardboard box. These elegant earrings are being sold for a low price by jewellers, EleQueen. This jeweller makes a fantastic selection of jewellery ranging from earrings, bracelets and necklaces. Take a look at their website, you’ll love their collection! If you want something more classy and minimalistic to wear on your wedding day, these earrings will look gorgeous with your wedding dress. 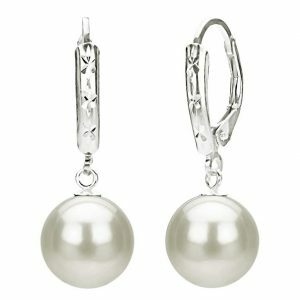 Featuring fresh water pearls, these dangly earrings are an extremely classy accessory to wear on your special day. You’ll notice straight away that they have been designed with the pearl as the main feature. These pearls are cultured fresh water pearls which are a round shape that has a clean surface with no blemishes. The color of the peal is white and they are approximately 9mm in diameter. These gorgeous pearls are positioned on a sterling silver metal. When it comes to the backing these earrings offer a lever-back backing, offering a comfortable but sturdy fit. One of the main reasons why we love these earrings are that they give off a very elegant and classy vibe and will transform any outfit, in particular your wedding dress! We’ve chosen these white fresh water pearls because we think they look utterly gorgeous but if you prefer a bit of color the designer also offers them in a grey, brown, black and pink color. What’s great about the white and pink coloured pearls is that they are 100% natural and have not been treated or dyed. If you’re not 100% happy with these earrings the designer offers a 45 day satisfaction guarantee return policy which is fantastic news. The designer of these earrings is a jeweller called La Regise Jewelry and these particular earrings are being sold for a high price. If you take a look at their extensive collection you’ll notice the jeweller has a passion for pearls. Their collection explores a variety of designs, showing off their talent when it comes to design. Each piece is unique and individual to the other. Take a look at their collection, you’ll love it! This is one of the more unusual pairs of dangly earrings that we discovered and just had to share with you! These earrings have definitely been designed with more of an art deco theme in mind. They are quite long like some of the other earrings we’ve reviewed and could be described as being a chandelier style. They also have a clustered feel to them. The materials used to create them include round clear rhinestones combined with beautiful crystals. Set together, this combo creates a sparkling piece that will be suitable to wear all day and night on your wedding day. When it comes to the type of crystals used in this piece they are actually simulated crystals which have been positioned on a polished allow metal. The combo of crystals and rhinestones also give these earrings a very unique design. They could even be compared to icicles. To give you an idea of the size these earrings are approximately 23mm wide by 9cm long. If you’d prefer a splash of colour these earrings also come in a red and gold colour. The earrings will arrive in a cute gold box with the branded name. These earrings are being sold for a low price and have been made by COOLSTEELAND BEYOND. This would definitely make a classy addition to your beautiful wedding dress. They consist of a square shaped jewel in the centre of the earring. Surrounding this there is a set of smaller diamonds that frame the large jewel in the centre. These earrings have been created using an 18k white gold plated metal. What’s great about this metal is that the ivy coloured metal is timeless, classic and trendy. You’ll also love the shine that comes from these earrings and they are nickel and lead free. 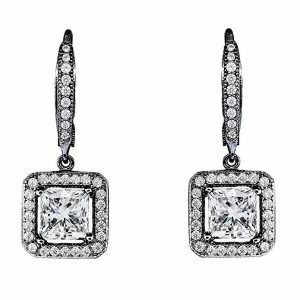 When it comes to the jewels this set of earrings features cubic zirconia crystals which are shaped into a princess cut. The quality of this stone is AAA+. The earrings are quite small. The square stone is approximately 1cm wide by 1cm high. They also have a 1.7cm hook drop. The closure of the earring includes a secure box with a tongue clasp providing great comfort for your earlobe and security so your earring doesn’t fall off. This classy set will arrive in a cute little jewelry box with a luxury ribbon wrapped around it. Another great thing about this jeweller is that they offer a money back guarantee if you not 100% happy with the earring. However we don’t think this is likely to happen! These earrings are also available in a variety of colours including black, yellow and rose gold, depending on your colour preference. These earrings have been created by Cate & Chloe and are being sold for a low price. The designers, Cate & Chloe love their crystals! Looking at their collection, all of their pieces have one thing in common, they love their crystals. Every piece is also unique and individual to the other. Their pieces are priced at a low price making them extremely affordable which is what we like to hear. Take a look at them for yourself! 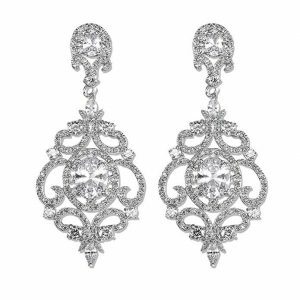 Another of our favorite bridal earrings is this gorgeous set designed by Mariell. If you’ve been searching for some earrings that will extenuate your neck, these may be what you’ve been looking for. 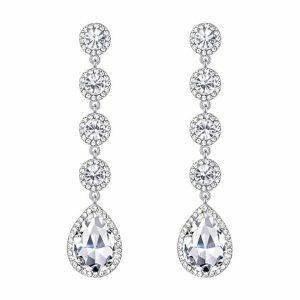 To catch your eye and gain your full attention this designer has decided to include a mixture of different shaped cubic zirconia stones to create these dangly earrings. You’ll notice the round, oval, pear and marquis shaped gems give this pair plenty of character and will certainly get heads turning. The earrings are also very slender and shimmer in the light beautifully when worn. These have been created using a silver platinum plating metal with a rhodium shine to it. The use of platinum will make these earrings durable and last for years to come. Another thing to point out is that the cubic zirconia gems are top quality, they’re in fact AAAAA quality which is fantastic news. The earrings are also made with metal posts and a comfort disc for the back of the earring making these earrings a very comfy fit. On arrival these earrings will come in a beautifully packed embossed Mariell box with the signature on the front of the box. The designer also offers a 100% money back guarantee. We think these would make a wonder addition to your wedding gown on your special day. The piece of jewelry has been created by designer Mariell who love their stuff. Sold for a low price, these earrings are a fantastic buy! If you take a look at their website you’ll notice the jeweller actually specialises in bridal jewellery which looks utterly gorgeous. Earrings, bracelets and necklaces, you want it they’ll make it. 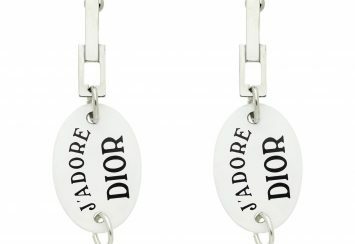 This designer definitely has plenty of class and makes their jewellery to the highest quality. See for yourself by checking out their website today. 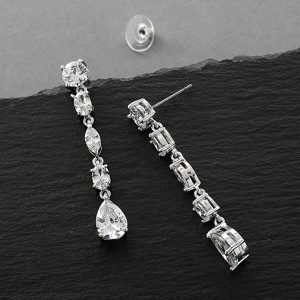 If you love your stud earrings but still want to make the most of wearing a bit of sparkle, these gorgeous earrings will look lovely if you decide to wear your hair up on your wedding day. They’ll also complement more of an elegant wedding dress. 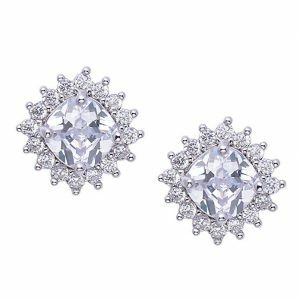 These stud earrings have been cut into a circular shape with a diamond in the center and surrounded by smaller diamonds around the edge of the main diamond. 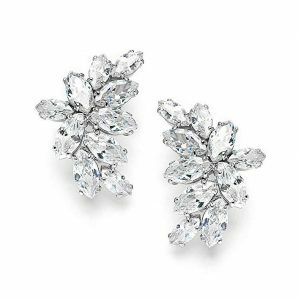 You could say that these earrings are shaped like a snowflake, making a truly elegant piece of jewelry. These have been created using a cubic zirconia gemstone in the centre of the stud and include rhinestones around the edge. It’s important to highlight that the cubic zirconia stones are of a high quality, in particular AAAAA which gives off a beautiful diamond-like shine. This shine will also make these studs stand out from a distance. The main structure has been made from a silver plated copper which is a very delicate metal. The earrings are also made with a copper post that has a bullet clutch earring back to them. This fastening detail allows for a very comfortable fit on your earlobe. We’re also pleased to say that these stud earrings are safe for you to wear if you have a sensitive ear because they’re lead free, nickel free and hypoallergenic. When it comes to the size, they are approximately 1cm high by 1cm wide, making a cute size. These earrings are also available in 24 different colours including rose gold, black, ruby, sapphire, pink, emerald, purple and violet. This means you can have a different colour for everyday of the week! The designers also offer a 30 day money back guarantee if you’re not 100% happy with your purchase. Interestingly, the style of these earrings looks very similar to the diamond studs that Megan Markel wore on her wedding day to Prince Harry. However we expect these earrings are a fraction of the price. They are very elegant and classy. The design is a very simple and elegant design. The studs are extremely lightweight and sit perfectly on the earlobe. These earrings made by jeweller, SWEETV are being sold for a very low price, making them a fantastic bargain buy. If you take a look at SWEETTV’s website they specialise in bridal accessories. Their website includes lots of elegant pieces that will be perfect on your wedding day including headbands, tiaras, hair vines as well as necklaces, earrings and headbands. Their wedding head pieces in particular are designed with a very minimalistic feel to them and have a natural earthy beauty about them. The jeweller offers pieces in silver, ivory, rose gold and gold colours, giving you plenty of choice. Their extensive collection of jewellery is also being sold for a very reasonable piece which is great news because we all know how expensive weddings can be! This is another of our favorite dangly earrings that offers plenty of character, shape and sparkle. 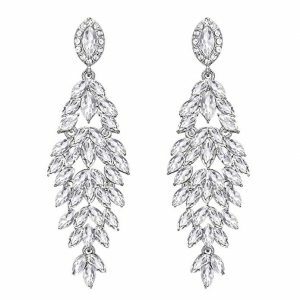 The earrings have designed to represent a beautiful cluster of layered leaves. The multi layer effect creates a striking impression, making these earrings stand out beautifully. To give you an idea of the size of these gems they are approximately 3.6 inches in length by 1.1 inches wide, making them a decent size. The materials used to create these are a selection of Australian crystals which is what gives the earrings their beautiful shimmer. They have also been crafted using an eco-friendly zinc alloy. It’s important to point out that these earrings are nickel and lead free so they’re safe to wear if you have sensitive skin. For the backing, these earrings have a post with a friction backing, making them very comfortable. We think these suit a bride which will have her hair down on her wedding day. A natural wave in the hair will also work well in complementing the shape and texture of these stunning earrings. What’s great about these dangly earrings is that they also come in a ruby red color, however this may not be suitable for your wedding day. The earrings are being sold for a low price and have been made by the designer, BrilLove. If you take a look at their website you’ll notice that they make gorgeous accessories for your wedding day. Necklaces, earrings, bracelets and hair accessories – take a look at their fantastic collection!